Our lives are a collage of languages: the languages we learn as vernacular and the languages we embody in our posture, action, and breath; the language in the spices of our kitchens, in what and how we eat; the language of ancestry and of circumstance; the language of learning. All of these languages employ their own grammar, from conjugations of clothing to etymologies of eating. Those of us who aren’t immigrants struggle with the combinations and permutations of spoken and unspoken languages. 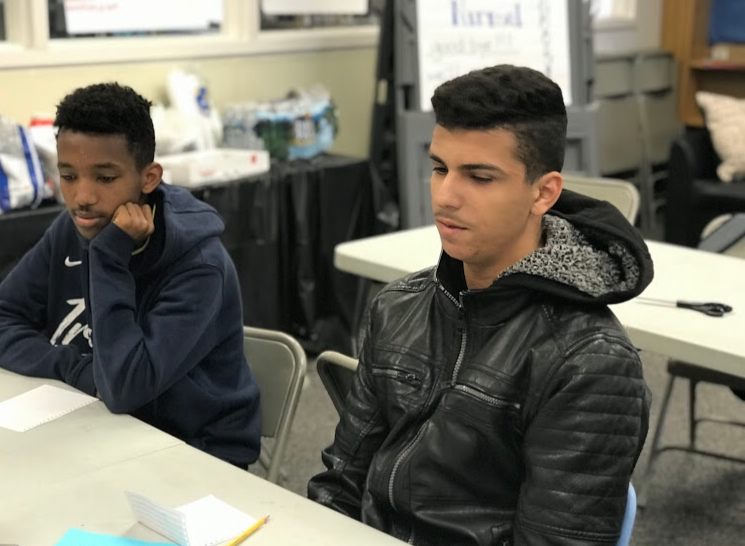 However, these nuances are more difficult for immigrant students, who in many school systems are expected to become fluent in English and American regional cultures rapidly, seamlessly, and without sustained support. Still, they express their utmost gratitude to this country and describe America in an idyllic way. When I spoke with Abdulrahman (Abdul), Beilul*, and Neima, they explained how they navigate translation and transliteration, from the desk to the doctor’s office, the ACT to attire. 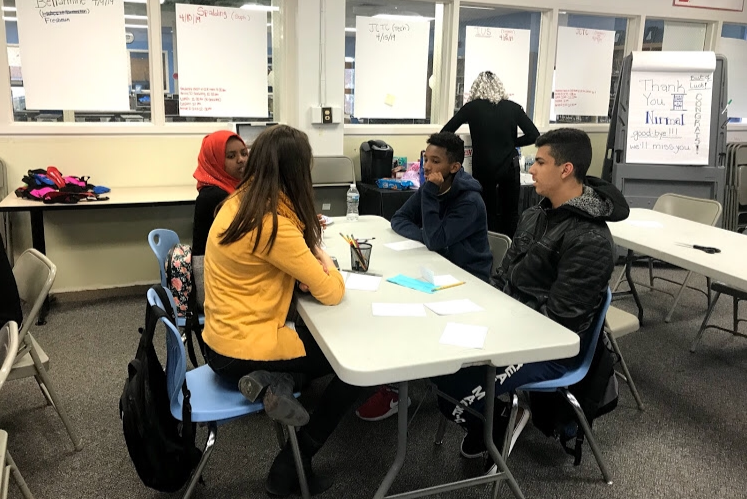 At their Louisville high school, one of Kentucky’s most diverse, students speak over fifty dialects, but when non-immigrants consider the challenges they face, we often address language too literally. Where were you before coming to the U.S. and what was life like? Abdul: I was born in Iraq, but my family is Palestinian. Before I came to the US in 2010, I lived in refugee camps for three years. It was intense: snakes, scorpions. The food we had to eat was from food cans the UN would provide us. When I came here in third grade, it was very difficult, an unexpected language, but now everything is normal. Beilul: I was born in Eritrea. Then I migrated to and grew up in Ethiopia because there was a war going on, so we had to fly out. The life there was okay, not like America, but it was good. We had everything we wanted. Not a lot of people were poor — they were farmers, so they made money to live on, and everybody had their own stuff. But not everybody had a lot, so we made use of what we had. We came to America because this is a better place where you can be anybody you want. If you work for it and you want it, you can become what you want to be. We came to America because this is a better place where you can be anybody you want. Neima: I moved to an Ethiopian refugee camp when I was eight years old. My first language is Saho, which we spoke in Eritrea. In the refugee camp, we spoke Tigrinya. When we moved to the refugee camp and I started school, it was really hard for me to speak Tigrinya. Also, if you are a refugee in Ethiopia, it’s hard to find a job and to live there. Then I came here when I was fifteen. Neima: It’s really hard. I mean, I didn’t come here because I wanted to but because I had to. At school, I was so afraid. When I first came, I was like, “Me no speak English.” I don’t speak English very well now, either, but I’m trying my best. Also, if you forget your first language, you cannot go back to your country. So you have to keep the old language. We don’t speak English at home, since my parents don’t speak English. Abdul: Everything was difficult at the beginning. Learning the language was difficult. We’ve been here for eight years now, and my dad still doesn’t speak English. Sometimes after school, I have to go to appointments with him to translate for him. He’s old and he forgets a lot, so the language is very difficult. I feel like now that I can speak English, I can talk to everybody and be normal. When I came here, though, it was just me by myself. I couldn’t talk to anybody. And the culture here is pretty adaptable — you can still practice your own culture. But I don’t even know how to read or write in Arabic now, because when I was growing up, I was learning it, but when we were selected to come here I didn’t get to learn. I feel like now that I can speak English, I can talk to everybody and be normal. When I came here, though, it was just me by myself. I couldn’t talk to anybody. Beilul: Learning the language and culture was hard for me also. When you move to a new country, adapting to that culture is hard because everything is different: cultures, food, what they wear. When we were new, we couldn’t speak the language, so they would just make fun of us, but I didn’t really care because I couldn’t hear them. What has your educational experience been like? Abdul: School’s not good in every aspect. Like, one of my teachers, I feel like she sometimes ignores me when I raise my hand and ask a question. She’ll pretend like she doesn’t hear me. Other students do that and she answers them. ESL teachers, the way they treat you and talk to you, they make sure you understand. Whereas my AP teachers, they use big vocabulary, so I just say “OK” because I don’t understand. Beilul: I don’t blame the teachers. They have a lot of students from different countries, so it’s hard for them to teach all of us at the same time. We all have our own mindsets and opinions, and the way we learn is different. It takes time, and they’re doing their best. Most of my teachers were born here, but their parents weren’t. So they can relate because their parents tell them their stories. They know what I came from, the struggles I went through to go to a new country. Neima: Some teachers, if you are ESL, they can understand you. They come to your desk and help you; they make sure you understand. But some teachers don’t care. They told you one time, so when the other student who was American understood it, they just leave. Sometimes, when the teacher asks you, you say “I understand” but you don’t understand. You don’t know what to say because of their English. Last year, I had a class where I was the only ESL student. So I always worked hard in that class. I didn’t want to speak with anyone. Some teachers, if you are ESL, they can understand you. They come to your desk and help you; they make sure you understand. But some teachers don’t care. Have you been thinking about your future aspirations? What does the process of achieving those goals look like? Beilul: The ACT is really hard. It’s hard to get the English readings; they use difficult words. They have a program where they give extra time for the ESL students, but even if you get extra time, you can’t understand it because you don’t know the words that they give you. And some kids are bad in school, but when they take the ACT, they might just guess on the whole thing and ace it. Neima: They told us that if you’re good at school, it doesn’t matter. If you fail the ACT, you can’t go to college. Abdul: My parents want me to go to college. It’s something that they didn’t have, because in my country, after you finish school, you just have to work. My dad is homesick; he wants to go back. But he did this for us. He did this for our future. That pressures me all the time. If I get a C in a class, he would be upset. In America, even if you don’t succeed, there are still more opportunities. But education is important to my family. As a kid, I wanted to be a soccer player, but that’s obviously not going to happen now. After college, I want to be a P.E. teacher. Beilul: For most immigrants, it’s okay, because you have your whole family to support you. But for others who are the oldest in their family, they have to get a job to support their family. Neima: I used to work. But it’s really hard to go to school and work. I used to work eight hours a day to help my family. After school, I would go from here to my job, I would go from my job to home, and then I would wake up at 6 in the morning. It was really hard for me. If you work for an hour or something, it’s okay, but eight hours is hard. You cannot get enough sleep. Have you experienced discrimination and how have you responded to it? How do you want to? Abdul: I don’t know why they don’t like letting immigrants in. We help here, too; we contribute. They say Muslims are terrorists and that’s why they hate us, but not everybody’s the same. Every country has people who are bad and people who are good. Not everybody in the US is good. Not everybody in my country is good. It really hurts to be called a terrorist. Not everybody in the US is good. Not everybody in my country is good. It really hurts to be called a terrorist. Neima: We are all human; just our religion is different. If you don’t talk to people who discriminate against you, they can talk more. But if you talk to them, maybe they can start to understand. They don’t know who you are and you don’t have to allow them to talk about you. I think if you tell them about your culture, about your religion, they can listen. Abdul: But it depends on the people. Some people just want to clown around and not respect others. If I tell someone I’m Muslim, the first thing they’re going to think is terrorist. And I can’t say anything back to them. You can’t do anything without others helping you out. Other than having the majority of people with you, I don’t know how you can change. It depends on the person’s character — if someone is mature, they will understand. But as an individual, we can’t really do anything. Neima: If we come together and can speak loud enough, we can change things. This interview was conducted by Emanuelle Sippy and transcribed by Sadie Bograd. It was edited by Emanuelle Sippy and Sadie Bograd. Names indicated with a * have been changed to protect the speaker’s privacy.